Originally from Kilmarnock, Scotland, Marshall is a writer currently based in the foothills of South Carolina, where she lives with her children, dogs, a set of bagpipes and a Royal Enfield motorcycle. Her fiction and creative nonfiction are published in a variety of periodicals — mostly recently in Northwords Now, Prime Number and Six Minute Magazine. 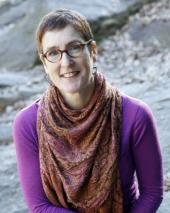 She holds an MFA in Creative Writing from Queens University of Charlotte.